Yayy!!! I have finally passed IASSC ICBB! Processexam thank you and grateful to all the experts behind it. I scored well in IASSC Lean Six Sigma Black Belt Exam.! I managed to pass my exam last Saturday. 84 % of all the questions. Just fantastic and amazing the amount of help that I found with your questions. like the Site tutor says, aim for 100% .. ALWAYS, as 10 questions are always brand new, nothing looks impossible and after taking excercise you can aim to finish in 1,5 hours. Really well-spent money for a excellent value. 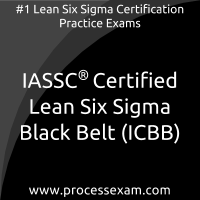 I had limited means to prepare for IASSC certified lean six sigma black belt certification exam. I could not afford personal tuitions required for the preparation. But, processexam.com gave me the same feel through its personalized approach. Thank you everyone. I got good scores. I like to thank process exam for the real test experience. I prepared rigorously for 1.5 months for this exam after having a formal training. I scored 660/750 and was excited about my results. I will definetely recommend process exam to anyone who wish to take IASSC Black belt examination. I passed at first time IASSC BLACK BELT the exam simulations help me to face the "real exam" quite sure and confidently !!! !